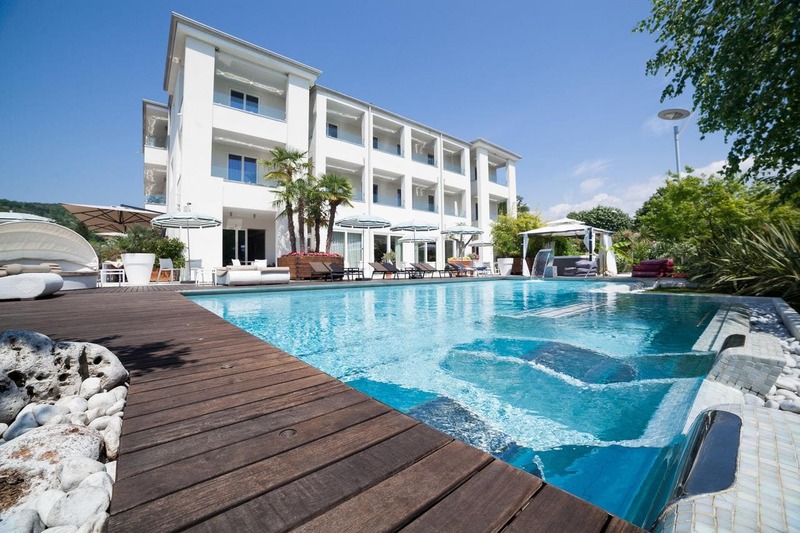 Offering an outdoor pool and a wellness centre with 2 saunas, the 4-star superior Hotel Tobago is located in Garda, 1 km from the shores of Lake Garda. Guests enjoy free WiFi, and free on-site parking can be booked. Fitted with contemporary furniture, the stylish rooms come with modern-art features and elegant parquet floors. Each one has an LCD TV, and a balcony overlooking the lake or the surrounding hills. This is the only hotel in Garda awarded with the Ecolabel certificate. Bikes can be rented at an extra cost at the reception. You can relax in the furnished garden, or on the rooftop terrace, provided with sun loungers and umbrellas. At Tobago’s restaurant, you can enjoy fish specialities and Italian classics. Gluten-free food and children’s menus are also available. A free snack is offered each afternoon. Other wellness facilities include a Turkish bath, Kneipp hydrotherapy, waterfalls and showers. A hot tub and Turkish bath are also available. Towels are included. Gardaland amusement park can be reached by car in around 20 minutos. The A22 motorway exit is 9 km.